Meramec Lakes Golf Course winds its way through the Meramec River valley and nestles into and atop the adjoining bluffs and hills just east of St. Clair in Franklin County, Missouri. 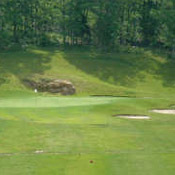 With its friendly environment and challenging golf, "The Lakes" is a must play. Visitors say the layout never gets boring no matter how many times you have played it. Meramec Lakes has undergone major changes over the last few seasons; if you haven't played it lately, you are in for quite a few surprises, starting with the first hole, which will probably get a big "WOW" when you see it. The greens are in great shape and zoysia is moving in the fairways. Class A PGA Professional Scott Brauer is now on the staff. Introduce yourself to Scott the next time you visit us; he will be happy to help you with your game.